Tyler has been with Progressive Medical Concepts since 2014, first working in the warehouse, making deliveries, and repairing equipment. Later, he worked as Assistant Business Office Manager while attending college. 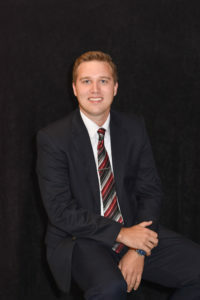 He graduated with a Bachelor of Business Administration with a concentration in Accounting from the University of North Georgia in December of 2016. In March of 2017 Tyler joined the Progressive sales team as the Territory Sales Manager for the state of Georgia. Tyler takes great pride in going above and beyond when it comes to customer service. Truly caring about each of his customers coupled with his upbeat personality results in customers loving to work with him. In his leisure, you might find Tyler on the golf course or spending time with his mother and five siblings. Tyler is very excited to be a part of the great team at Progressive Medical Concepts and looks forward to being a valuable resource in your facility.